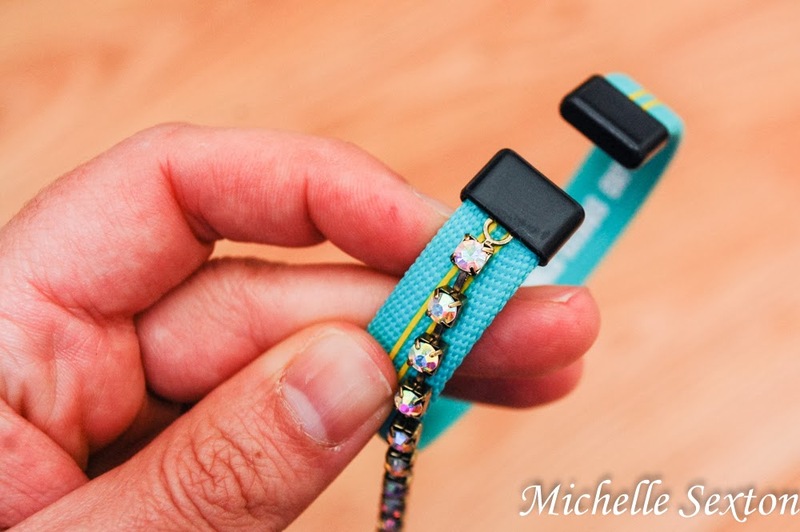 Start out by attaching the rhinestone chain down the center of the bracelet. I lucked out and was able to slip the ends of the rhinestone chain into the plastic tips on the bracelet. 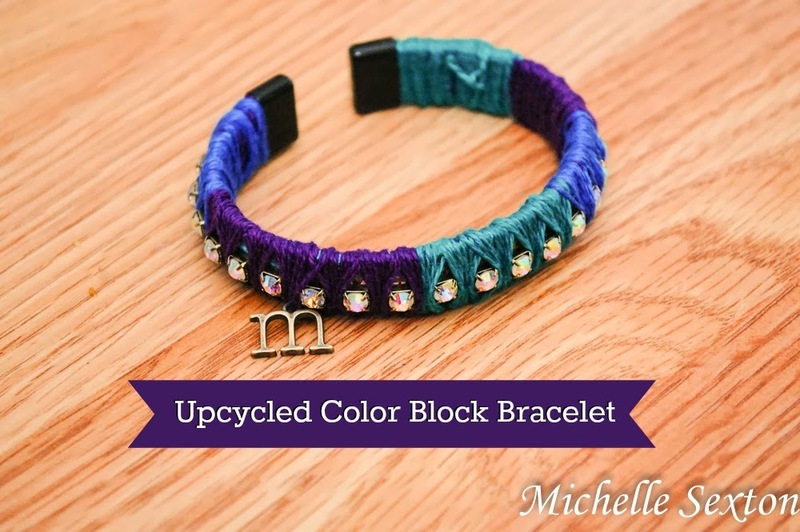 If this isn't an option for you (unless the bracelet is similar to the one I used), use super glue to secure both ends of the chain to the bracelet. Trim the ends of the rhinestone chain if needed. Once each chain link has been wrapped with the floss, begin wrapping to cover the entire bracelet, working your way from one end to the opposite end. 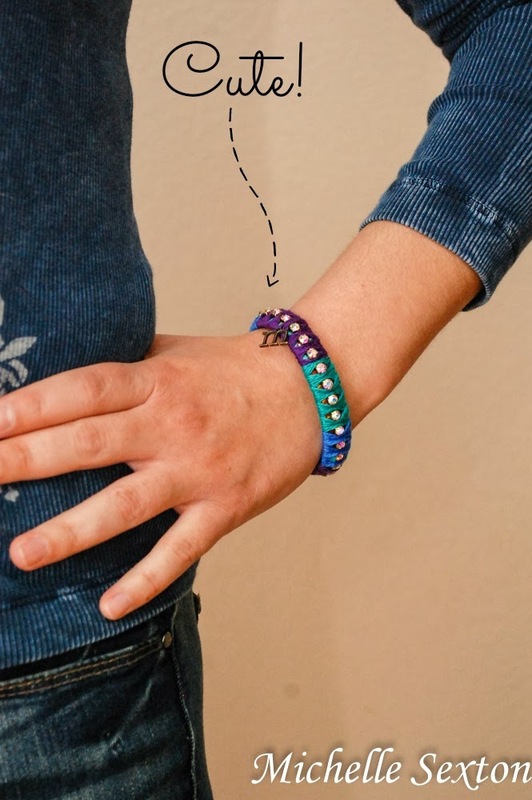 Wrap floss neatly around the bracelet, keeping each strand as flush as possible to the previous strand. Wrap floss as close to each rhinestone as you can. To change embroidery floss colors, tie both ends of the different colored floss into a square knot, and continue to wrap. Be sure to hide the knot, as you continue to wrap. 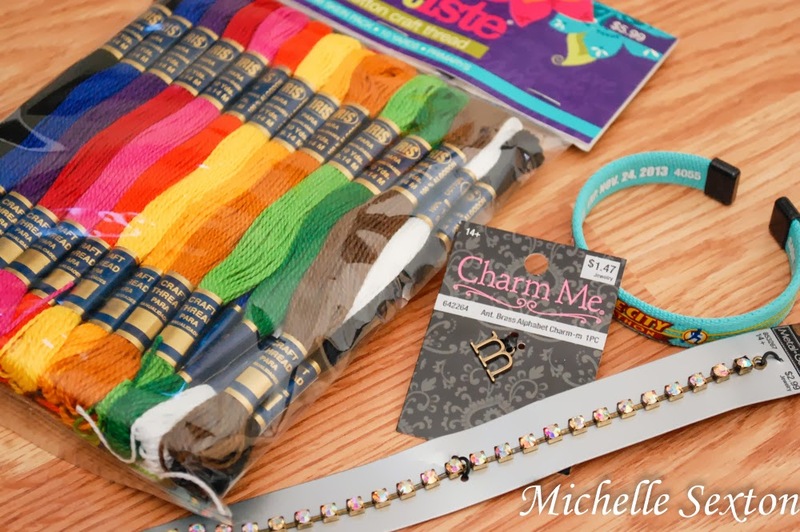 Continue wrapping until the entire bracelet is covered, and switching floss colors as often as desired. There's truly no wrong way to do this. At some point during the wrapping process (maybe after 1/3 of the bracelet has been wrapped), string the charm onto the floss when changing floss colors and continue wrapping. If you forget to do this (like I did), it can be tied on afterwards, using matching floss, and hiding the knots and trimmed ends. 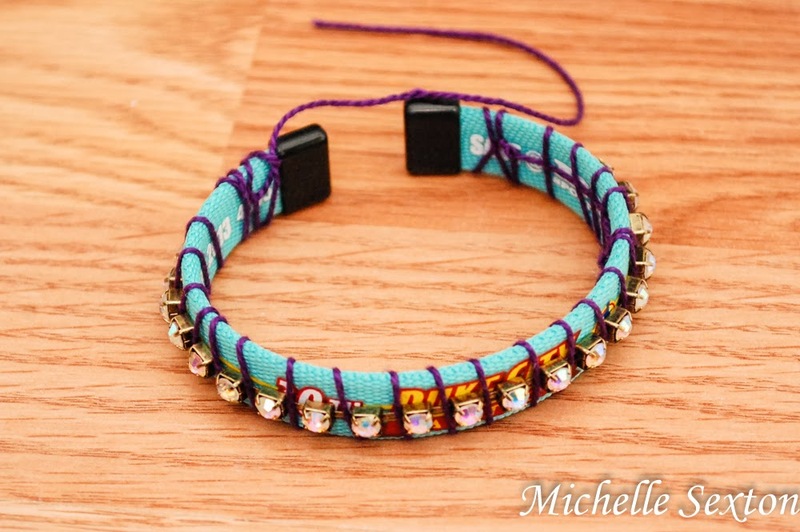 Once the entire bracelet is wrapped, tie a square knot to secure the floss to the bracelet. Trim and hide the ends underneath the wrapped floss. I used a small crochet hook to tie the final knot and keep it tight. - I had plastic ends on my bracelet that allowed me to wrap the floss onto the bracelet without the floss slipping off the ends. 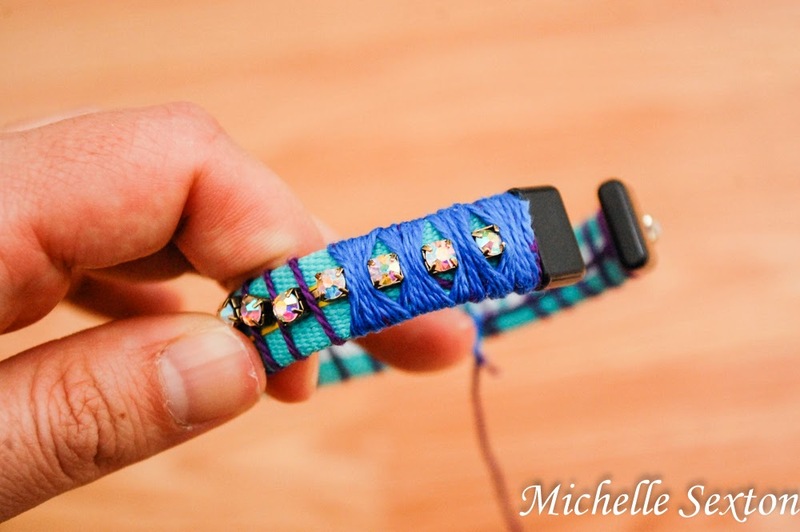 If this is not an option, tie the floss with square knots and secure them to the bracelet using super glue. Once the super glue is dry, wrap over the super-glued sections again to conceal any super glue. 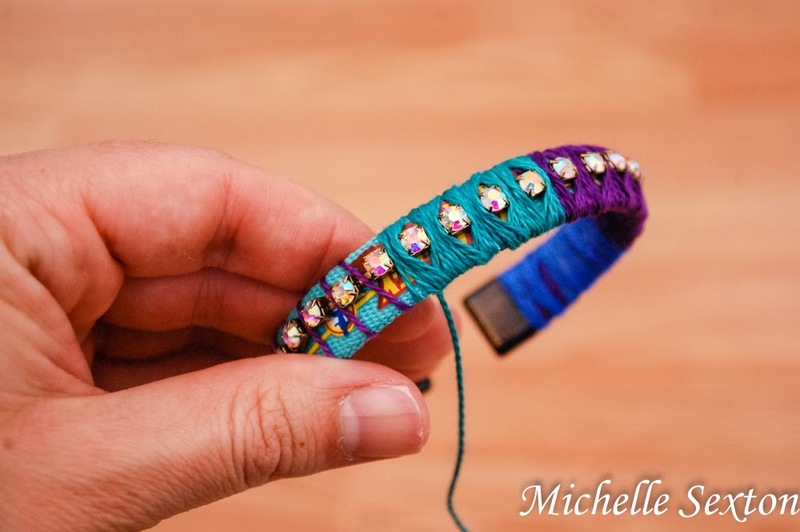 Repeat these steps on the opposite end of the bracelet once the entire bracelet has been wrapped. - Square knots are crucial to prevent the embroidery floss slippage. That's a really cool way to upcycle! I'm going to have to raid my jewelry stash! 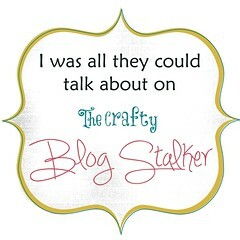 I found you via Anti-Procrastination Tuesday - thanks for sharing! 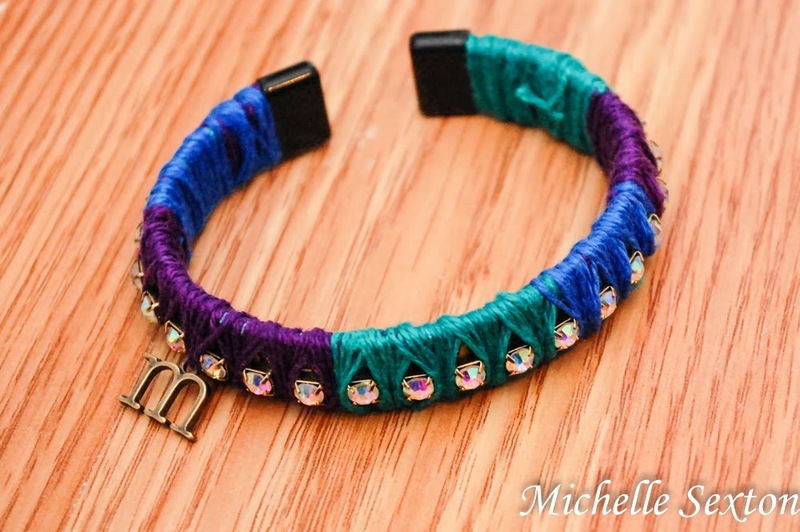 Cute bracelet, and it looks pretty easy to make! I like the colors. Thanks for the great comments. I hope you all enjoy making it! I'd love to see pics of yours on Twitter or Instagram when you make them. What a great idea. Now I need to look around to see what I can revive with a little bling. I love being able to personalize jewelry to fit your wardrobe. This looks so fun. 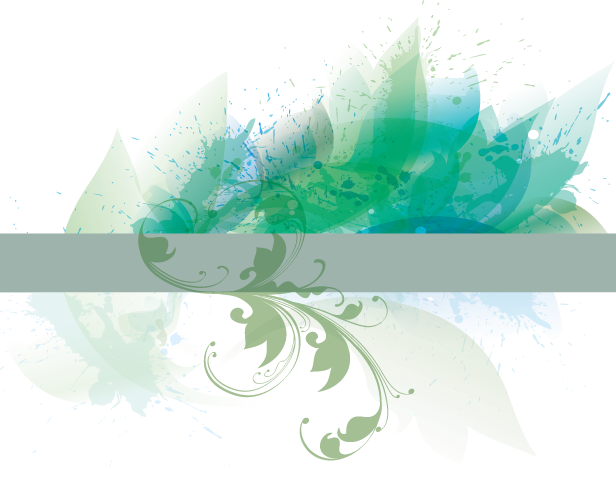 Thanks for linking it with us at Made From Pinterest.